U of T’s team of students place 4th in the 2017 Putnam Competition! U of T’s team (hosted by our department) did well in the 2017 Putnam Competition coming in 4th place. The team consisted of three undergraduate students: Michael Chow, Itai Bar-Natan, and Dmitry Paramonov. Michael Chow (4th year student) placed in the top 25. Itai Bar-Natan (4th year student) received honourable mention, placing in the top 100. Dmitry Paramonov (3rd year student) placed in the top 200. The Putnam Competition is a mathematical competition open to undergraduate students across Canada and the United States. It is held annually since 1938 and is written in December. Teams consist of three members that represent the institution, although additional undergraduate students can participate. Over 4,500 students from 575 institutions participated this December with 47 students coming from U of T.
Several students from U of T also placed well including: Lexiao Lai (exchange student) making the top 200; Rafael Aznar (3rd year student), Adrian Carpenter (1st year student), Anthony Moshe Roitman (1st year student) making the top 500. Since the fall, students have been training diligently under the guidance of two faculty members: Bernardo Galvao-Sousa and Alfonso Gracia-Saz. The Department of Mathematics extends congratulations to the team and thanks Bernardo and Alfonso and all participants for their efforts! The link to our department’s webpage on Putnam can be found here. More information of the Putnam Competition can be found here. The announcement of 2017’s winners can be found here. The selection committee consisted of Mary Pugh, Abe Igelfeld and Peter Crooks. Nominations were made by faculty members, course instructors, and undergraduate students. The awards recipients will receive a monetary award and a certificate during our awards/graduation reception scheduled for Thursday, May 26 at 3:10 p.m. in the Math lounge. Congratulations Tracey, Beatriz, Nikita and Asif! Congratulations to our graduate student, Peter Crooks, winner of the 2016 CI Teaching Excellence Award. Peter is co-supervised by Lisa Jeffrey and John Scherk and is working in the area of Lie Theory and Equivariant Geometry. Peter is defending his thesis this Wednesday, May 4, 2016. We thank the faculty members, undergraduate students and course instructors who took the time to submit their nominations. We have many excellent instructors and teaching assistants who are hardworking and regularly inspire and challenge their students. Congratulations once again to Nicholas, Geoffrey, Yuri, Ali, Yuan Yuan, Trefor and Benjamin! And very best wishes to our graduating class! 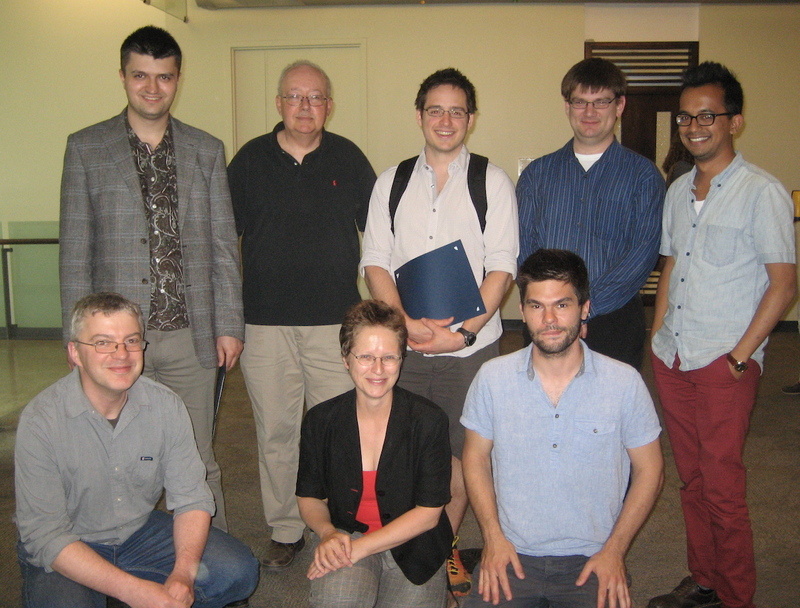 Yuval Filmus, who completed his PhD in 2013 for his thesis Spectral methods in extremal combinatorics at the University of Toronto, was recently awarded the 2015 CMS Doctoral Prize along with Hector H. Pasten Vasquez (Queen’s University). This is the first time the award was given to two recipients which speaks to the quality of both their work. Congratulations to both Yuval and Hector on this prestigious award. The Department was proud to celebrate the accomplishments of our Graduate Students and PostDoctoral Fellows last week with a reception honouring recipients of three Departmental awards and one University wide award. The TATP Teaching Excellence Award was created in 2003 to recognize the outstanding contributions of teaching assistants at the University of Toronto. The award seeks to value the work of TAs who regularly inspire and challenge undergraduate students. This year’s winner was Asif Zaman. Asif is a second year PhD student of John Friedlander and is working in the area of analytic number theory. This was the inaugural year for this award. The award is based on donations from individuals, charitable organizations and companies from the VEDANTA Society of Toronto, and they are matched, dollar for dollar by the Provost. These donations will allow the department to be able to endow several new Fellowships for graduate students. Vivekananda was a philosopher and spiritual teacher (1863-1902). He founded the Ramakrishna Mission in India and the Vedanta Society is a branch center of that Mission. The Vivekananda Fellowship is meant to fund the study of an international doctoral student in mathematics. This year, the committee chose Ivan Livinskyi as the recipient of this scholarship. Ivan is a second year doctoral student working under the supervision of Professor Steve Kudla. Congratulations to all our winners and our sincere appreciation for all your hard work and effort! Congratulations to our graduate student, Asif Zaman, one of the four the recipients of the 2014 TATP Teaching Excellence Award. The Teaching Assistants’ Training Program’s (TATP) Teaching Excellence Award was created in 2003 to recognize the outstanding contributions of teaching assistants at the University of Toronto. The award seeks to value the work of TAs who regularly inspire and challenge undergraduate students. Asif is a second year PhD student of John Friedlander and is working in the area of analytic number theory.